The aim is to teach and develop a diploma and master’s-level counseling programme at Colombo Theological Seminary (CTS). The programme will integrate psychology and theology, to meet a serious lack in the Sri Lankan church and the need in Sri Lanka for trained counselors. This is a pioneering ministry in the Protestant church. Over the past two years, CTS counseling classes have had increasing interest, with 25-40 students attending. The seminary currently offers only a Certificate programme in Christian counseling. With no other accredited Christian counselor training programme offered in Sri Lanka, the needs and the interest are immense. Fulfilling and sustaining the vision of the programme at higher levels requires more trained faculty. Those who come to Colombo could also meet a pressing need through providing counseling services for the urban, English speaking population, as well as training lay counselors in other regions of Sri Lanka with the use of interpreters into Sinhala and Tamil. Counselors - To mentor and assist new local counselors to improve and grow in their profession. Lecturers - Counselor lecturers to establish and manage a new counseling programme for Sri Lankans through Columbo Theological Seminary. Pray for the provision of counseling lecturers to develop and sustain the current certificate programme in counseling at Colombo Theological Seminary. 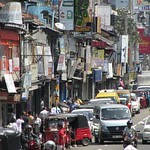 Pray for a Christian counseling centre to be developed in Colombo. Pray for training and development of competent lay and professional Christian counselors for Sri Lanka. Plantar Iglesias entre los pobres urbanos en Colombo, con un enfoque en el pueblo tamil.